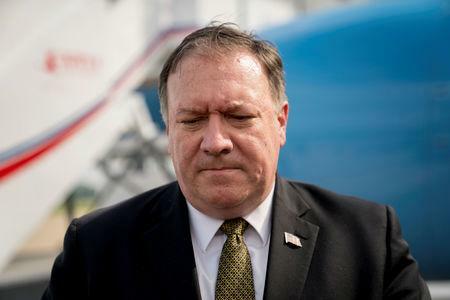 (Reuters) - North Korea's state-controlled newspaper on Sunday accused the United States of "double-dealing" and "hatching a criminal plot" against Pyongyang, after Washington abruptly cancelled a visit by Secretary of State Mike Pompeo. Negotiations have been all but deadlocked since U.S. President Donald Trump's summit with North Korean leader Kim Jong Un in Singapore in June. Pompeo has pressed for tangible steps toward North Korea's abandonment of its nuclear arsenal while Pyongyang is demanding that Washington first make concessions of its own. North Korea's Rodong Sinmun newspaper said U.S. special units based in Japan were staging an air drill aimed at "the infiltration into Pyongyang", citing a South Korean media outlet. "Such acts prove that the U.S. is hatching a criminal plot to unleash a war against the DPRK and commit a crime which deserves merciless divine punishment in case the U.S. fails in the scenario of the DPRK's unjust and brigandish denuclearisation first," the paper said. "We cannot but take a serious note of the double-dealing attitudes of the U.S. as it is busy staging secret drills involving man-killing special units while having a dialogue with a smile on its face," it noted. The editorial, which did not mention the Pompeo visit, urged Washington to give up the "pointless military gamble" and implement the Singapore agreement, in which the leaders pledged to work towards a complete denuclearisation of the Korean Peninsula. Trump partly blamed China for the lack of progress with North Korea and suggested that talks with Pyongyang could be on hold until after Washington resolved its bitter trade dispute with Beijing. China expressed "serious concern" about Trump's comments, which it called "irresponsible".